Postcards from every country and territory in the world. That which is significant about this blog is I have visited all the post offices and locations exhibited. If you have a love of travel, postcards and stamps, this site is for you. When completed it should be the first site to have at least one postcard sent by one person from every postal administration. 327 countries/territories plus some extra Islands. This all started with my love of postcards in 2004. Enjoy! At the monument, "We are the Mountains "
The entry to the Post Office in Shushi, was not in good condition and no sign. Asia-Republic of Artsakh-Shushi This is the Cathedral of Christ the Holy Savion in Shushi . About 45 minutes from Stepanakert . Not much else to see here. But the last part of Artsakh to be taken from Azerbaijan during the war. I have to say the Post office here I would never have found. It was my guide and driver who knew where the Post office was. At the top of a broken building with no sign. The Post Office itself, could have done with a little love. Will post photos at some stage here. 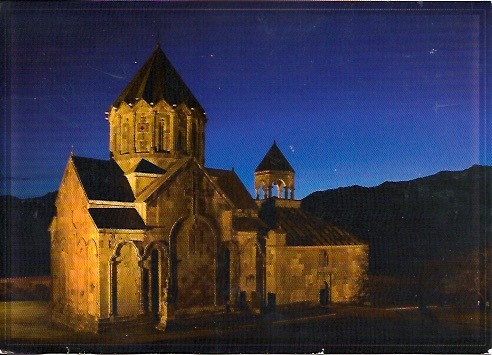 Asia-Republic of Artsakh-Gandzasar This is the Cathedral of St. John the Baptist. 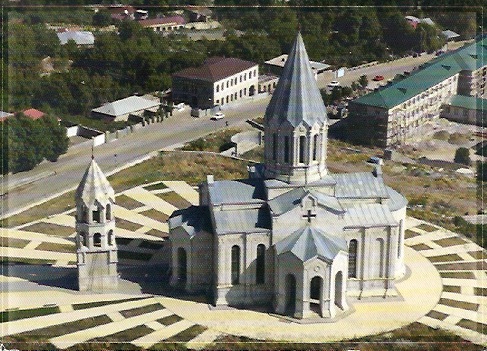 This is the seat for The Bishop of Artsakh. It is well worth a visit and there is an excellent museum there. 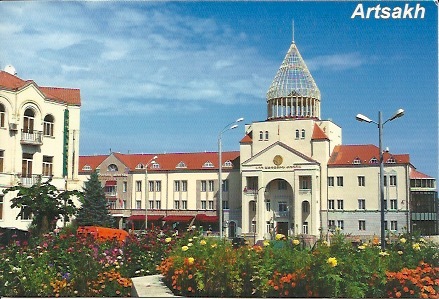 This card has a mix of stamps , the two on the left are the Republic of Artsakh and the one on the left is Nagorno Karabakh stamp. I posted this in Shushi . 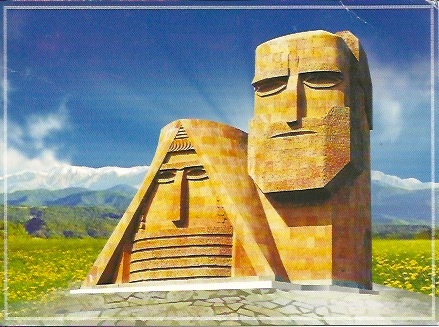 Asia-Republic of Artsakh-Stepanakert This is the most famous tourist site, it is just on the start of the capital. It was built in 1967 and is called " We are the Mountains ". 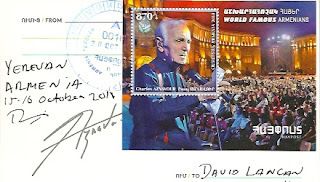 These stamps are the most recent issue from Republic of Artsakh. The Post Office in the capital is very helpful and they have a philatelic display . However they may did not have a full selection in stock. Asia-Republic of Artsakh-Stepanakert This is the capital of Artsakh, Formally known as Nagorno Karabakh. You get here via Armenia and you need a visa that you can get in Armenia at the "Embassy " there. Here is a postcard s showing the central area. 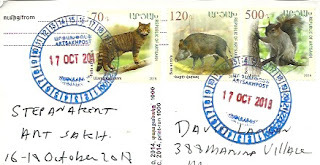 These stamps show the new name of Artsakh. The Post Office still sells a mix of these and Nagorno Karabakh stamps. The Post is sent out via Armenia . Asia-Armenia-Yerevan This Postcard shows the famous French singer Charles Aznavour . His parents are from Armenia. 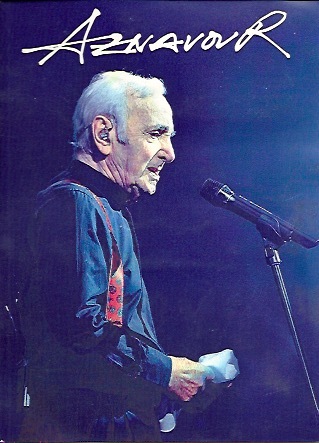 So here they consider him a Famous Armenian. I was in Yerevan on the day that this sheep was issued. I have to say that the Philatelic Shop was busy all day with customers lining up to buy these stamps. I have to say I think it is a beautiful issue. Asia-Armenia-Yerevan This is my second time back to Armenia and it is a delightful Country to visit. On this occasion I only visited Yerevan the capital. 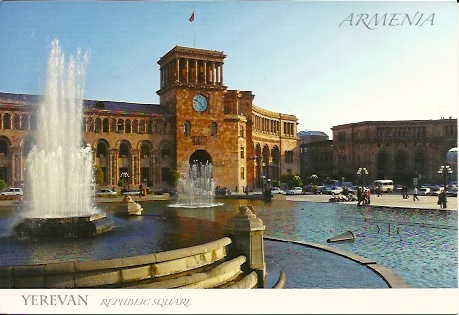 This card shows the central square with Government buildings . The Post office is in the building on the right. I am very pleased to have a card from Yerevan. As last time it never made it back. This card shows the symbol of the Armenian genocide . All the following show the main Post office in Ljubljana which has a philatelic counter. This is me ready to board the ship to Tokelau . Early departure about 6am. One of the islands from the ship. This building is the main administration building on Nukunonu . The middle floor includes the Post office and Immigration. They share the same office. The Post office is in fact just one desk. But the same staff do Immigration and the Post office. The top floor is the only Hotel where I stayed. Inside of Post office and Immigration office. The wonderful Postmaster who opened the Post office on the Saturday night at 10pm for me.. That is service. CANADA - Banff National Park - Lake Agnes.